The Gene Smart Diet: The Revolutionary Eating Plan That Will Rewrite Your Genetic Destiny–And Melt Away the Pounds is written by Floyd H. Chilton, PhD, founder and former director of Wake Forest’s program in molecular medicine. According to him understanding how your genes work is the secret to weight control and reducing your risk of disease. Chilton says, “You help decide which genes express themselves and in what way, largely by what you’re putting on your plate”. By following the Gene Smart Diet you can improve your health by reducing the likelihood of certain chronic diseases, slowing down the aging process and accelerating weight loss. Polyphenols are found in dark-skinned fruits and vegetables such as red grapes and cherries as well as in legumes, nuts, seeds, dark chocolate (only permitted in maintenance phase) and green tea. They have been associated with enhancing protective genes and regulating metabolism. Dieters are advised to consume 1250-1500 mg of combined EPA and DHA each day by eating fish or taking fish oil capsules. Borage oil supplements are also recommended for an intake of at least 400mg of GLA per day. The authors claim that a high intake of fiber is the most important factor in reducing calories and losing weight and recommend at least 30 grams daily. Dieters who are overweight are advised to reduce daily calorie intake by 20 to 30 percent of that needed to maintain their current weight. This phase is the most demanding and starts with a one-day soup fast. During this phase you will trigger your adaptive stress response so that you can make a physical and mental break from your past. Calorie intake is around 1600 per day. Phase one lasts for three weeks or until you have achieved your ideal weight. During this phase you condition your body to the diet that you should follow for the rest of your life. It is less stringent than phase one and involves increasing calories to around 1800 per day. You will also increase your level of physical activity at the same time as increasing your intake of polyphenols and omega 3 fats. The goal of this phase is to balance the amount of calories that you eat with those that you burn so as to maintain your weight loss. You continue to ensure a high intake of polyphenols and omega 3 fats as well as adhering to a regular exercise schedule. During the maintenance phase you are also allowed to introduce 4-6 ounces of red wine and 1-3 ounces of dark chocolate into the diet each day. Salmon, crab, shrimp, lean meat, whole grains, fruit, vegetables, low-fat dairy, eggs, nuts, legumes, red wine, dark chocolate. The goal of doing exercise in the Gene Smart Program is not primarily to lose weight but for its role in reducing inflammation in the body. The book includes an exercise plan and the general guidelines for the program are to exercise at least five days a week for a minimum of thirty minutes. A combination of aerobic exercise, circuit training, and weight training are recommended. 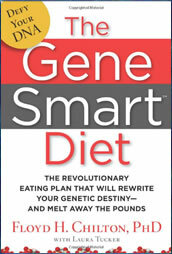 The Gene Smart Diet: The Revolutionary Eating Plan That Will Rewrite Your Genetic Destiny–And Melt Away the Pounds retails at $25.99. Meals are created specifically to reduce hunger and promote satisfaction after eating. Designed to promote weight loss as well as optimal health. Includes five different meal plans with recipes and shopping lists. Provides specific information regarding genetic diseases. Does not take into account individual variations in calorie requirements. May require extra time for food preparation. Recommends the use of supplements to be purchased from the author’s website. The Gene Smart Diet offers a high-nutrient eating plan that will not only assist with weight loss but also reduce the risk of disease. By increasing the intake of polyphenols, fiber and omega 3 fats, while simultaneously increasing exercise, you will support the expression of the genes that enhance health.